Uh, Guys? I Think The Wizards Forgot To Fire Randy Wittman? Coming into Sunday's game in Detroit, the Washington Wizards had lost two straight and 9 of 13, a month-long stretch of almost uniformly horrendous basketball in which they've fallen from second to fifth in the East. After the 38-point beating they took from the Cavs at home this past Friday, even that fifth-place standing seemed tenuous. And if, for one eight-minute stretch of the second quarter, those struggles might have seemed to explain the urgency and intensity with which the Wizards turned a three-point deficit into an 11-point lead, they do a pretty good job of making sense of what came after that stretch, too. The Wizards imploded; the Pistons pounced; that 11-point lead turned into a deeply embarrassing 17-point loss. The Wizards are desperate and hungry and all that, sure—but also, they're just not very good, and that's more important. Blaming this collapse on head coach Randy Wittman probably isn't totally fair. A lot of very fluid stuff makes a basketball team successful or not, and plenty of it isn't under the coach's control. But, on a nightly basis, one of the opponents the Wizards compete against—in addition to, y'know, those guys with the other-colored shirts—is the observable and abundantly well-documented fact that offensive efficiency on a basketball court is a thing that exists. That's a battle Wittman has them fighting, on purpose, by design, and on top of their normal work duties. If Wittman is Ahab, reality is his white whale. How talented would the Wizards have to be to kill it? Depending on your rooting interest, watching the Wizards play offense is either maddening and inexplicable, or hilarious, or both. A perfectly typical Wizards possession begins with John Wall bringing the ball up to the wing on one side of the floor, passing it to another player at the top of the arc, and then fighting his way through a forest of elbows in a long looping run along the baseline, to emerge beyond the arc on the opposite wing and catch a pass leading him away from the basket, whereupon the offense resets. It isn't done with the tempo crucial to making a ball-reversal work, and it doesn't lead into any subsequent action; other than burning off eight or so seconds of shot-clock that could have been spent on an actual effort to warp the defense or create a shot, and making Wall tired, it accomplishes nothing that could not be done simply by having Wall bring the ball up on the opposite side of the floor. And this isn't even the dumbest way the Wizards routinely and deliberately work against themselves! That honor goes to the set in which Bradley Beal passes the ball to a big along the arc, then darts back and forth across the big's face, trying to shake his defender off so he can receive a handoff ... five feet from where he was standing when he made the initial pass, with both a defender and his teammate crowding him and his momentum stringing him out along the arc instead of carrying him toward the lane. Even in the rare instances in which this inexplicable, Sisyphean act of scripted nowhere-getting does not result in a frantic, fumbled handoff to a young shooting guard whose ballhandling is his most glaring weakness, it gets the Wizards nothing they couldn't get by having Beal just dribble to the wing his damn self and call for a screen. In either case, it wastes time another team might reasonably spend on trying to score some points. Here's a version of that one. Beal doesn't make the pass to Nene, here, but look at where he is when he takes the handoff, relative to where he was when he started the dumb back-and-forth action required to get it. He's moved four feet! And, look at where the ball goes next! To John Wall, two feet from where he was when he initiated the play. Nothing has changed except the time. It's like Dadaist basketball! When these and other similarly pointless scripted actions don't work—they don't work—the Wizards reset to a rushed high screen-and-roll, or dump the ball on poor Nene in the post, against a firmly entrenched defense, and watch him pump up a jumper. Sometimes they do that without even trying anything else first. Okay, so, you guys make a few aimless passes back and forth to each other, then dump it down to Nene so he can take an 18-footer with 14 seconds left on the shot-clock. The funniest part of this play is John Wall actually calling it at the beginning of the video. This is a play you call? With a hand-signal and everything? It's like scripting a flat tire. Opposing teams long ago caught up to Wittman's one novel offensive idea—designing pick-and-roll sets that took advantage of Wall's unique ability to whip sniper-accurate passes to the opposite corner while driving hard toward the hoop—and, turns out, there just aren't any other tricks in his bag. The dreary go-nowhere sets described above bear fleeting resemblance to things the Spurs (those looping baseline runs to flip the offense from one side of the floor to the other) and Bulls (the handoff sets where the big acts as passer and screener at the same time) do, but damn, some data sure seems to have been lost in the import. The whole thing proceeds effortfully—a testament both to Wittman's apparent motivational skill and to his players' professionalism—but with no evident purpose; one action proceeds from another in a manner superficially suggestive of basketball tactics, but what the sequence is meant to produce, or how, mechanically, it is meant to produce that thing, is never clear. It's like the performance of a deeply unnecessary magical rite whose practitioners do not understand it: I don't know how or why pouring tincture of frog spleen on a lock of burning virgin's hair is supposed to make Dana from accounting meet me at the restaurant next Friday evening for a romantic dinner, but I've been told this is how it works. Meanwhile, the Hawks are over here just, y'know, asking Dana from accounting to go out on a date. You might forgive these byzantine means if they either produced, or were designed to produce, worthy and difficult-to-attain ends for the Wizards. They don't! By Wittman's own admission, reiterated in several crotchety defenses of his reasoning, he wants his players taking the shots the defense gives them, no matter which shots they are. By design, the shots most freely handed out by defenses are the worst ones, so you won't be surprised to learn that the Wizards attempt the third-most midrange shots in the NBA, the fourth-fewest three-pointers, and the tenth-fewest shots inside the restricted area. So you've got grinding, pointless, time-wasting actions, designed to create shots the Wizards could get just by asking, out loud, "Hey, can I get a 19-footer?" and watching the defense part itself voluntarily. It's like a Rube Goldberg device designed to drop an egg on the floor. These are the Wizards: a talented team pursuing a stupid strategy via even stupider tactics, on purpose. Ironically, much of this can be traced to the exact approach that helped the Wizards improve so immediately when Wittman took over as interim coach after the firing of Flip Saunders in January of 2012. The team he inherited was a catastrophic, uncoached mess, and Wall, the face of the franchise, had stagnated into the bad habit of hurling himself into the thick of compressed defenses on every trip up the floor, as though if he tried hard enough he could overcome a 15-point deficit with one heroic play. Wittman, to his enormous credit, convinced Wall and the team to focus on defense, and on offense to calm down, trust the plays, and have faith they could make the shots those plays created. For Wall, it was the basketball equivalent of closing up your batting stance on an 0-2 count and slapping an outside pitch the opposite way, rather than insisting on trying to pull it to the next zip code. To extend the analogy: their hitting improved almost immediately. This is what a good interim coach does. He or she walks into a bad situation pushing pared-down ambitions—let's play like professionals, for chrissakes—and a mechanical, effort-focused version of the sport, geared toward improving the performance of the team's best or most important player. It works because it allows a group of embarrassed, shell-shocked players, who just got their previous coach fired and likely aren't feeling so great about themselves or each other, to switch their scrambled minds off and just do, just play. Go through the motions, but do it hard, like you mean it. 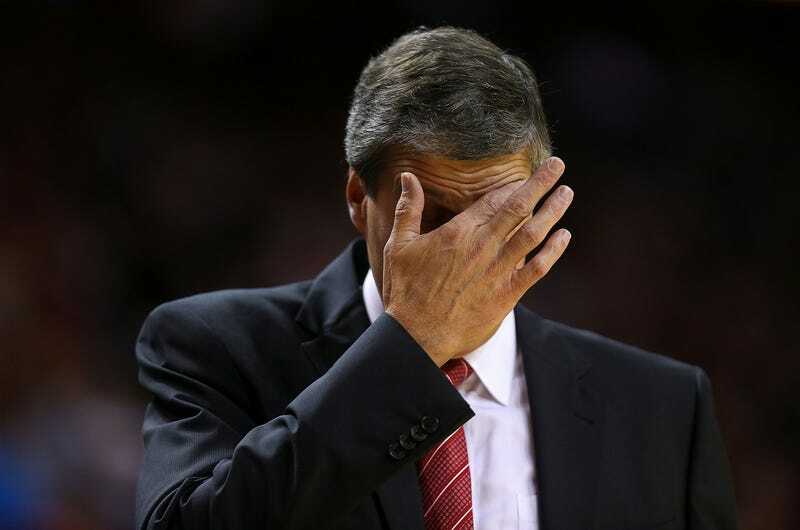 And it demonstrated something admirable about Wittman, too. Here was a coach who wasn't trying to prove his own genius, just trying to make basketball make sense to some bummed-out players who were tired of being humiliated all the time. The problem, here, is that the traits that make for a good interim coach are not precisely the same as those of a good permanent head coach. A good interim coach thrives on how well his simplified, no-brainer basketball suits and refreshes a confused, lousy, psychically exhausted team; in most cases, he won't be around long enough to have to figure out any other moves. A good permanent coach, by contrast, can't improve a team just by getting the players to follow a plan; at some point, it has to be a good plan, or there's only so much they can do with it. A secret the interim coach may never get a chance to figure out is that, Kendrick Perkins aside, most NBA players are really, really, really good at basketball. And not just good at it, but smart as hell about it! They've been playing it forever, they know it inside-out, and they're capable of doing it intelligently with only a little more conscious deliberation than you or I devote to flinching away from a sudden loud noise. Knowing this, and taking advantage of it, is what good, permanent coaches do. The brilliance of, say, Mike Budenholzer isn't his ability to dream up revolutionary complexity in basketball play design; nor is it some magical insight that told him friggin' DeMarre Carroll, for example, is some special basketball savant. It's that he trusts his smart basketball players to be smart basketball players: to understand what kinds of shots are good shots to take, and why; to do quick, elegant stuff—like, for example, a screen, right at the beginning of the possession, just to get the ball moving toward the basket and a defender taking a step away from somebody else to contain it—to put themselves in advantageous position with as much time as possible to take advantage of it; and to keep themselves and the ball moving, not until the defense gives them a shot, but until it gives them the shot they want. Not so with Wittman, who's been a stopover coach in so many bad situations that maybe the interim outlook is all he knows. There's scarcely room anywhere in all his scripted time-wasting for the actual Wizards players to be smart; to react quickly and make decisions; to start the opposing defense scrambling and ping passes around to each other, one step ahead of the rotations and closeouts, until somebody finds himself with both the ball and a good look at an efficient shot. There's neither time nor freedom for it. They run their wasteful, elliptical scripted actions, the ball going nowhere in particular and moving the defense not at all, and those don't work, and then somebody obeys the mandate to crank up the first open 19-footer, and that's it. As though nothing good possibly could come from the players using the extra time to work for a shot worth taking. The passive 19-footer either goes in or it doesn't. It's a system with distrust of its practitioners hard-wired into it. One of the more annoying prescriptions coaches haul out when asked how their slumping teams can get better is the one that goes, "We've just gotta make shots." As if a struggling player might hear that and go, "Wow, I hadn't considered that making shots might be better than missing them," and go out and giving shot-making a try. But, in the Wizards' case, they're only as good as their ability to make an above-average percentage of the dumb, passive shots their coach wants them taking. When they make a lot of those bad shots, it's usually enough to supplement Wall's superhuman individual play; when they don't, they lose—and that's the extent of Randy Wittman's insight into it. Whatever the problem, play defense, try hard, and execute is his answer, because it's the only thing that ever worked for him. But, precise and effortful execution can only raise a bad plan to mediocrity, the mean to which the talented and once-promising Wizards are regressing at damn near supersonic speed. And Randy Wittman is still coaching for the interim; his native soil is the interim. Probably the Wizards will be better off when the interim is over.